Just North of the nation’s capitol is FedEx Field, home of the Washington Redskins. No the stadium is not in Washington, DC, but in Landover, MD. The Redskins spent over two decades at RFK Stadium and struggled nearly a decade on the location to build FedEx Field. In the mid 1980s Redskins owner, Jack Kent Cooke, envisioned a new stadium for his team as he was dissatisfied with RFK and proposed building a 78,000 seat domed stadium adjacent to RFK Stadium. Cooke agreed to build the stadium contingent on the terms that the city would assume responsibility for the infrastructure and parking. The National Park Service opposed the plan because it would fill a portion of the Anacostia River for stadium parking. Until 1992, negotiations between the Redskins and the District continued as Cooke maintained that he wanted a stadium built in DC. Even so, the team had discussions with Fairfax and Loudon Counties in Virginia, just in case discussions with DC failed. Unfortunately for the Redskins this occurred and in April 1992, negotiations between the Redskins and the District ended. It appeared the Redskins would move to Alexandria, VA after Cooke signed an agreement with the State of Virginia in July 1992 to pay for a $250 million stadium. However, by October this plan was also abandoned and the Redskins began negotiations with the District again. After a long wait, in February 1993 the Redskins finally signed a formal agreement to build a stadium in Washington, DC. QB Joe Theismann wins NFL MVP and Offensive Player of the Year in 1983. 26 players inducted into NFL Hall of Fame including Coach Geroge Allen, Sonny Jurgensen, John Riggins and Bruce Smith. This plan unraveled by October 1993 as environmental studies and government obstacles delayed the stadium project. After this, Cooke was so frustrated that he no longer wanted to build a stadium in DC. Two months later he bought land in Anne Arundel County, MD to construct a stadium. In October 1994 Anne Arundel County rejected Cooke’s proposal for a stadium leading him to purchase land in Landover, MD where he reached an agreement to build a 78,000 seat stadium in December 1995. Construction began immediately on the stadium. After years of struggling to get a stadium built Cooke sadly never saw his stadium completed. He died several months before the stadium was completed. Initially, the stadium was named, Jack Kent Cooke Stadium. The Washington Redskins played their first game at Jack Kent Cooke Stadium on September 14, 1997. With 80,116 seats, it was the largest stadium in the NFL. Three tiers of red and yellow seats circle the entire playing field. Two video-boards are located beyond both endzones. In 1999, Daniel Snyder bought the Redskins and decided to sell the naming rights to Federal Express. Jack Kent Cooke Stadium was renamed FedEx Field. Since he bought the team in 1999, Snyder has spent millions of dollars renovating the stadium. Before the 2000 season, nearly 3,000 seats were added, including a new owners club suite level and escalators to the upper deck. FedEx Field was expanded again before the 2004 season. The seating capacity was increased from 86,000 to over 91,000. Ten rows of seats were added to the back of the lower bowl section that rings the north half of the stadium. The number of luxury suites also increased from 199 to 243. After the 2009 season, the video/scoreboards located in both endzones were replaced with new 100 foot long HD video/scoreboards. FedEx Field has many amenities including several restaurants that overlook the field and a Redskins Hall of Fame. Displayed on the upper level balcony, circling the seating bowl, is the Redskins Ring of Fame that contains 40 names of Redskins players and coaches. Located above the north endzone are championship flags that commemorate the Redskins playoff history. 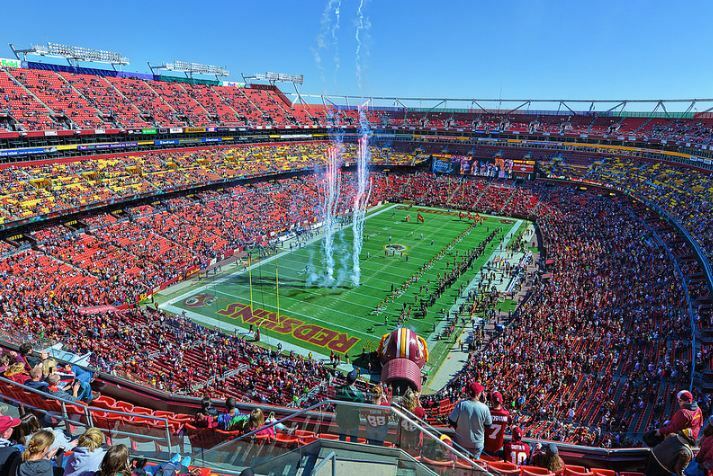 FedEx Field is no longer one of the largest stadiums in the NFL. After the 2010 season, over 6,000 seats were removed from the endzone areas of both upper decks. 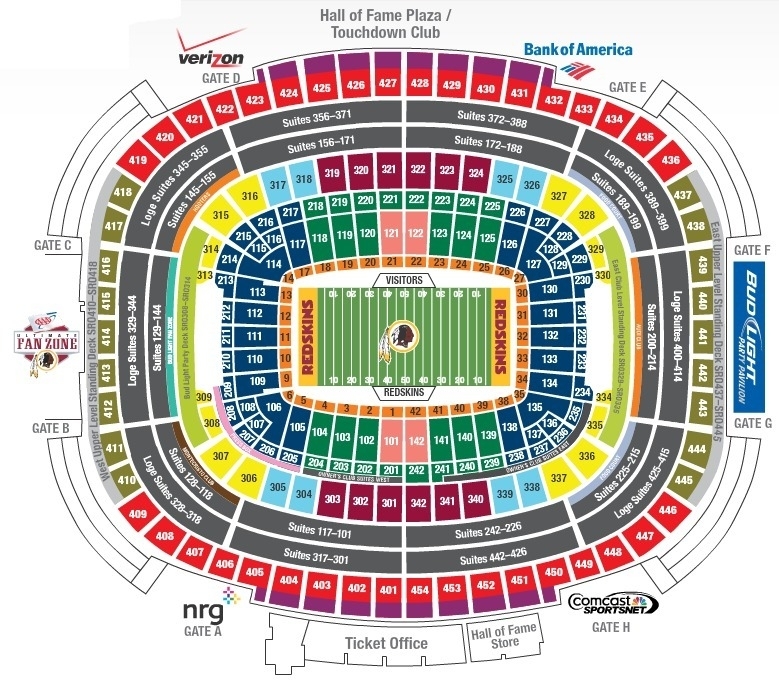 The Redskins removed the seats in order to create a party deck, standing room only, sections in each endzone. After the 2011 season an additional 4,000 seats were removed further reducing the seating capacity to 79,000. Renovations to the fifth level luxury suites were also completed before the start of the 2012 season. The capacity of the stadium was further reduced prior to the 2015 season when the Redskins removed the top eight rows of the upper deck. The team is currently exploring options of possibly building a new stadium, possibly on the site of RFK Stadium. In March 2016 the team unveiled a concept of a potential 60,000 seat stadium. No potential sites or opening dates have been determined.